Recently listed as one of the top 20 coolest chalets in Europe by the Times newspaper, Chalet Miro is a beautiful and luxurious chalet with private outdoor hot tub, perched in the hillside overlooking Haute Nendaz, just a few minutes walk from the ski lift, bars, restaurants and shops. Offering incredible views over the village of Nendaz, the Rhone Valley and beyond, it accommodates 12 guests in six spacious bedrooms on the ground and upper floors, (three king bedrooms and three twin bedrooms). The chalet is kept warm and snug by the luxurious under floor heating, and a roaring log fire. We can offer TV, DVD, music system with bluetooth connectivity, wifi, as well as DVDs, books and toys for our younger guests. Chalet Miro is comfortable and spacious, with lots of space for large groups and families. Every bedroom is tastefully furnished with style and character, offering breathtaking views over the valley, and all are warm and welcoming after an active day on the mountains. The high specification kitchen with polished granite worktop bar, boasts a large oven and hob, two good sized built in fridge freezers, microwave, dish washer and lots of other mod cons to cater for large groups of people. The wide terrace and patio area house the secluded hot tub, an ideal place to watch the sun set over the Rhone Valley. Whether you come to ski in the winter months, walk on the many bisses, mountain bike, enjoy the alpine festivals or simply relax in the summer months, there are countless activities put on by the Nendaz tourist board throughout the year for all ages. We live in Scotland and Switzerland with our two young children and operate a holiday cottage business on the shores of Loch Tay in the Scottish Highlands and a ski chalet business in the heart of the Swiss Alps. Our properties range in style, age and size - they range from renovated farm steadings to boathouses and alpine chalets, but all have a great sense of homeliness and beautiful views, as well as lots of little luxuries to help everyone unwind and enjoy their holidays, no matter how old or young they may be! After buying the land in 2006, the chalet was finally finished in time for it's first guests in the winter of 2008. We love the fact that there is something very special about the homely feel of the chalet and we would live there all the time if we could - the combination of the central location, the friendly village, the fantastic views and the comfort of the chalet itself makes it the perfect place for a break all year round. The chalet offers the ultimate in alpine luxury, with fabulous views from the spacious living and dining area and the bedrooms.The property offers a private hot tub on the terrace, open fire in the living and dining area, as well as luxurious underfloor heating throughout the chalet. There is wifi, TV, stereo and DVD, plus many DVDs for people to watch. The chalet is located on the hillside in the centre of Nendaz, just minutes away from the restaurants, bars, shops and ski lift, yet set in a quiet and tranquil enclave with stunning views over to the village and the Rhone Valley. Just perfect for winter and summer breaks! Bathrooms benefit from underfloor heating, baths and powerful showers, as well as large sinks and toilet facilities. Fully equipped with all the modern conveniences..
-TV, DVD, Stereo with bluetooth connectivity -Hot tub -Toys, games, DVDs and books -Cot and high chair -Discounted ski / bike equipment hire and ski lessons -Spectacular views over Rhone Valley -Open Fire -Open plan living and dining area -Luxurious underfloor heating -Spacious accommodation with beautiful furniture and facilities. We enjoyed every moment in the chalet, which is as advertised. The beds are comfortable and the kitchen well equipped, and the views are fantastic. We loved our “home away from home”! This is a spacious, clean, and comfortable home——perfect to come home to after a day of adventure or sight seeing. The kitchen has everything you need to prepare meals, including some spices and oils. We cooked several meals and enjoyed dining while taking in the surrounding views. We also spent a lot of time on the terrace, playing games at the table or enjoying the hot tub. The beds are very comfortable and there is plenty of storage for your clothes and belongings. The home also came with a variety of DVD’s and a gaming system which was fun! We thoroughly enjoyed our stay at Chalet Miro! WE HAD THE MOST AMAZING STAY AT CHALET MIRO! CHALET MIRO IS A BEAUTIFUL CHALET AND VERY WELL EQUIPPED, IT HAS EVERYTHING YOU CAN THINK OFF!. THE VIEWS ARE AMAZING, YOU CAN SEE FOR MILES DOWN THE VALLEY. WE DID A GOOD BIT OF WALKING ALONG THE MANY BISE TRAIL PATHS WHICH WERE ALL VERY WELL SIGN POSTED AND EACH HAD DIFFERENT LEVELS OF SKILL DEPENDANT ON YOUR ABILITY YOU COULD WALK/HIKE FOR MILES. WHILST OUT ON OUR TREKS I ENJOYED HEARING THE COW BELLS JINGLING AND LOOKING AT THE MANY NUMEROUS STYLES OF CHALETS AROUND, THEY REMIDED ME OF CUCKOO CLOCKS. THERE WAS PLENTY OF WILDLIFE ALL AROUND, WE HAD THE PLEASURE OF WATCHING AN EAGLE PERFORM ITS MANOUVRES IN THE AIR AND ALSO HAD A LARGE DEER LEAP FROM NOWHERE ACROSS THE PATH THAT WE WERE WALKING ON. AFTER OUR DAY OUT WE SPENT TIME RELAXING IN THE FABULOUS HOT TUB TAKING IN THE MAGNIFICENT VIEWS AROUND US. NOT ALL RESTAURANTS AND BARS WERE OPEN DUE TO THE TIME OF YEAR WE VISITED NENDAZ (OFF SEASON) BUT THERE WAS AMPLE AMOUNT TO KEEP US ENTERTAINED. THE VILLAGE HAD A FEW SUPERMARKETS TOO, WHICH HAD EVERYTHING THAT WE NEEDED DURING OUR STAY. IN THE RESTAURANTS, THE FOOD WAS GOOD QUALITY AND THE SERVICE WAS EXCELLENT IN ANY PLACE WE ATE OR HAD A DRINK IN. WE VISITED THE 2 X CASTLES IN SION AND A LOVELY LITTLE MARKET WHICH BRINGS THE TOWN ALIVE ON A FRIDAY. ALSO A DAY TRIP TO ZERMATT, HOME OF THE MATTERHORN IS WELL WORTH A VISIT. WE HIRED A CAR WHILST WE WERE IN NENDAZ AND THAT IS SOMETHING I WOULD HIGHLY RECOMMEND AS IT GIVES YOU THE FREEDOM TO EXPLORE THIS BEAUTIFUL AREA. I WILL DEFINATELY RETURN TO THIS MAGICAL PLACE. Situated in the heart of the Four Valleys at an altitude of 1500 meters, the alpine resort of Nendaz shares over 400 km of pistes with the renowned neighbouring ski resort of Verbier. 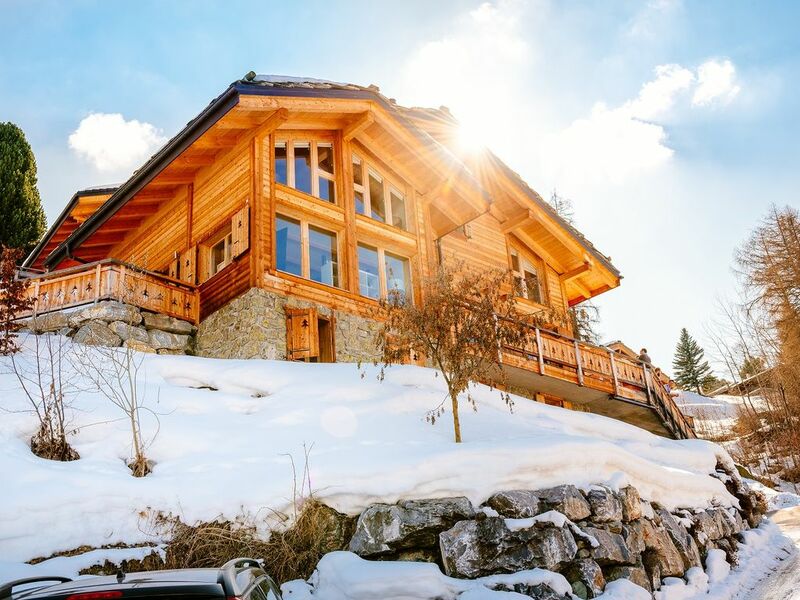 Our luxury six bedroom Chalet Miro is nestled into the hillside with breathtaking views of the mountains and Rhone Valley, yet just minutes away from the piste and the buzz of the resort. With spacious living, dining and kitchen areas, as well as roaring log fire inside and hot tub on the private terrace, the chalet offers the perfect base to relax at the end of a day on the mountains. Please note that a fully refundable good housekeeping deposit is also required. The chalet is strictly a non smoking property. The owners cannot accept pets within the chalet or in the grounds of the chalet. The maximum number of people to be in the chalet is strictly 12. Tourist tax is included within the rate, as well as electricity, water, sheets and towels and the final clean.